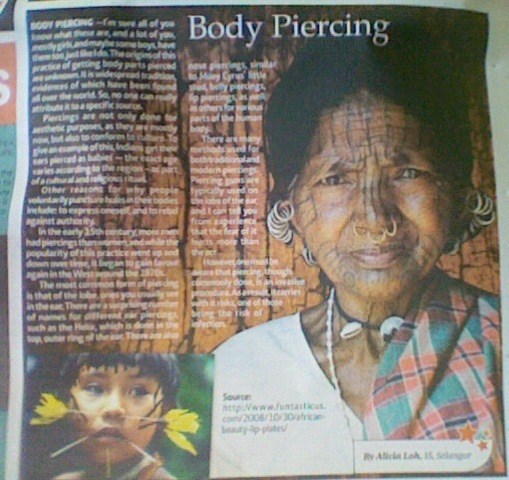 Today's Niexter issue in on Body Art, and I was one of the editors, so be sure to grab a copy!! Piercings are not only done for aesthetic purposes, as they are mostly now, but also to conform to culture. To give an example of this, Indians get their ears pierced as babies — the exact age varies according to the region – as part of a cultural and religious ritual. Other reasons for why people voluntarily puncture holes in their bodies include: to express oneself, and to rebel against authority. In the early 15th century, more men had piercings than women, and while the popularity of this practice went up and down over time, it began to gain favour again in the West around the 1970s. The most common form of piercing is that of the lobe, ones you usually see in the ear. There are a surprising number of names for different ear piercings, such as the Helix, which is done in the top, outer ring of the ear. There are also nose piercings, similar to Miley Cyrus’ little stud, belly piercings, lip piercings, as well as others for various parts of the human body. There are many methods used for both traditional and modern piercings. Piercing guns are typically used on the lobe of the ear, and I can tell you from experience that the fear of it hurts more than the act. However, one must be aware that piercing, though commonly done, is an invasive procedure. As a result, it carries with it risks, one of those being the risk of infection.